A is for acrobatics – The troupe put on an incredible display of tumbling, swinging, leaping, high flying martial arts and feinting. I found the acrobatics in a few areas somewhat clumsy at times. Not sure if that was intentional or just opening glitches. D is for dance- Now we’re talking! The dancers are incredibly ethereal and graceful. They delicately complement the enchanting music. The Princess is a perfect blend of athleticism and elegance. I would see the entire show again for the dance sequences in the middle and toward the end. The panda also proves he can get way down and boogie with the best of them. A is for accoutrements – This is where the show truly will beguile one and all. The ninja costumes are ornate and intricately detailed. The Princess and her dancers wear the sparkle and shimmer (and ornate headdresses) you expect to see on a Las Vegas stage. What so impressed me was the outstanding background graphics on the massive state-of-the-art multilayered LED wall: Another very good reason to see this visually spectacular show more than once. PANDA! at The Palazzo Theater came to Vegas direct from Beijing. It’s directed by An Zhao and produced by a team whose credits include the opening and closing ceremonies of the 2008 Summer Olympics in Beijing. 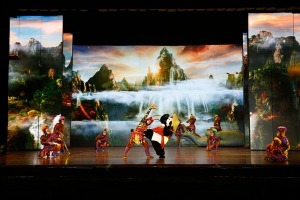 The cast features award-winning performers from the China National Acrobatic Troupe and the Shaolin Monastery Kung Fu Monks Troupe. 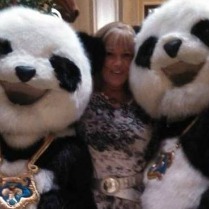 For tickets and more information, please visit: http://www.palazzo.com/Las-Vegas-Entertainment/Resident-Shows/Panda/ or call 702.414.9000.